The No. 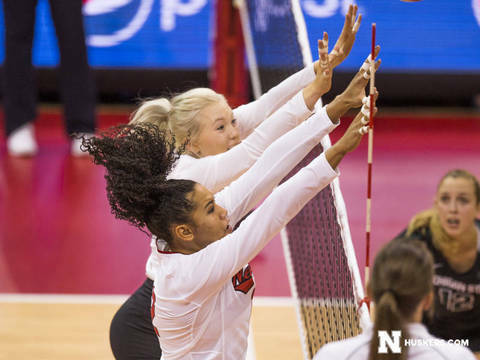 3 Nebraska volleyball team improved to 2-0 in the Big Ten with a 3-1 (25-18, 25-9, 21-25, 25-16) win against Michigan State in front of a crowd of 8,102 at the Bob Devaney Sports Center on Sunday afternoon. NU hit double-digit blocks for the fourth straight match, out-blocking the Spartans 12-9. In addition to Stivrins’ seven blocks, Callie Schwarzenbach and Jazz Sweet each had five. Sweet also had seven kills. Set 1: Nebraska held Michigan State to .030 hitting to take set one, 25-18. Foecke, Sun and Sweet combined for 11 of the Huskers’ 12 kills. After Michigan State had trimmed a six-point Husker lead to 17-15, NU went on a 4-1 spurt to take a 21-16 lead. The Huskers scored the final three points of the set via a Foecke kill, a block by Sun and Schwarzenbach, and an MSU hitting error.